China's Rise: Inward-Looking Or Expansionist? From inside China, it can often seem that modern Chinese power is more aimed at erasing a painful past than at writing a dominant future. The problem is that with a growing military and with increasingly assertive foreign and commercial policies, China doesn't always look that way from outside. From inside China, it often appears as if modern Chinese power is more aimed at erasing a painful past than at writing a dominant future. But there is one topic where the peace-loving Chinese seem worryingly militaristic: Taiwan. If you're looking for lessons from history about the direction China might take in the future, an ominous place to come is to a beautiful, ancient stone bridge lined with stone lions on Beijing's outskirts. It's now a minor tourist attraction, but it was here in 1937 that a small skirmish led to the full-scale invasion of a weakened China by a resurgent Japan. A TV documentary narrated in serious tones plays inside the museum that stands near the bridge. It reminds visitors that as Japan modernized and industrialized, it sought to expand, and then invaded all of Asia. But suggest to ordinary Chinese people here that the pattern of modernization and industrialization in China could lead to something similar, and you will be met with shocked faces. Zhang Wuming, 87, remembers the Japanese occupation of China. But he says China will never bully anyone when it becomes strong, and it will never become like Japan. His younger sister Zhang Ailing agrees, and can't resist a dig at Japan itself. Don't worry about China, she says, but make sure you write about how many Chinese people the Japanese killed. That's why we need to be strong, she adds, because otherwise we'll be bullied and occupied again. From inside China, it can often seem that modern Chinese power is more aimed at erasing a painful past than at writing a dominant future. The problem is that with a growing military and with increasingly assertive foreign and commercial policies, China doesn't always look that way from outside. But there is one topic where the peace-loving Chinese seem worryingly militaristic: Taiwan. The people of Taiwan are Chinese people, says Zhang. And Taiwan is Chinese territory forever, says his sister. China wants to reunify peacefully, she continues, but won't give up the right of force. Not surprisingly, that causes concern across the Taiwan Straits among politicians, academics and heavy-metal rock bands alike. China A Threat To Taiwan? Taiwan being a democracy, people can say or sing what they like, and the band Shanling has even put its anger toward mainland China into a song supporting Taiwan's independence. It's not just the headbangers who are wary of China. "Many people in Taiwan see China as a threat to Taiwan," says Bi-khim Hsiao, spokeswoman of the opposition Democratic Progressive Party. She says the threats from China are no longer just military. "Nowadays they are diversifying their tactics toward Taiwan to use economic leverage," she said. This includes economic leverage to influence Taiwanese businesses and how they make their political donations, she said. "Even though our local law forbids Chinese ownership of Taiwan media," she said, "the Chinese ... indirectly — through acquisition of other foreign companies and media outlets — ... have an influence on public opinion in Taiwan." That is not just happening in Taiwan. China's financial largesse is being felt across Asia as the Chinese use their formidable new wealth to win themselves friends. Many countries in the region are engaging with China, but as China builds up a blue-water navy, and bolsters its commercial penetration of the developing world, most of those countries are continuing to strengthen their links with the U.S. as well, just in case. As China spreads its influence abroad, though, there are plenty of problems still at home. Liu Shuzhen, 80, sits weeping as she explains in an interview what happened one night six years ago at her home in Shanghai: In 2005, she says, dozens of men, including police and officials, smashed down her door and dragged her outside so they could demolish her house to make way for the Shanghai World Expo. Her daughter was detained trying to come to this interview. Her daughter's friend has come instead. Fan Guijuan says she also had her house demolished to make way for the expo, but now she travels regularly to the capital, Beijing, to protest. Amid the dazzling skyscrapers of modern China, there are thousands upon thousands of dissatisfied, disenfranchised people like her, the flotsam and jetsam on China's rising tide of prosperity. Whenever there is a sensitive political meeting or visit, these protesters are detained at home or in a cheap hotel for anything up to 40 days, and watched around the clock by large teams of guards, to prevent them from making trouble. 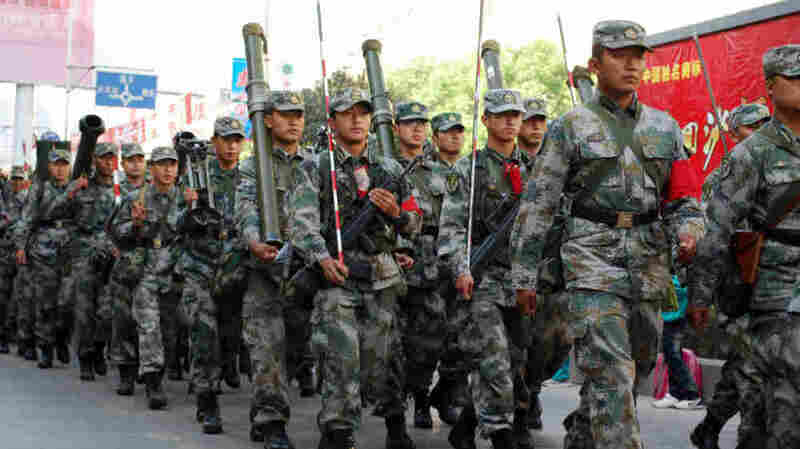 China announced this year that its public security budget at home has surpassed the country's military budget for the first time. Asked about China's future, Fan gives a wry smile. Foreigners don't need to worry about an expansionist China abroad, she says. This government has its hands full dealing with its own people, she adds. They are the words of a woman pushed to the limit, but they represent a broader truth — that amid all the extraordinary changes in China in recent years, there is one very big challenge left. "The main challenge that China faces ahead will be in politics," says William Kirby, professor of history at Harvard University. "No political party stays in power forever. "And a great challenge for leaders of ... [China] is how does one begin this process of reform without losing control? And I fear right now that insofar as one can tell is you have a government that knows how to do lots of things extraordinarily well, but in this area, it seems barren of ideas." But even if it manages to turn that barrenness into a fertile field of political ideas, it still isn't clear whether China will be a threat or whether it will be able to continue its rise. What is clear is that those questions are likely to be decided by what happens inside China itself. What is also clear is that China's next 30 years can't be like the past 30 — economically because the natural environment cannot sustain it, or politically because the human environment can probably not sustain it, either.